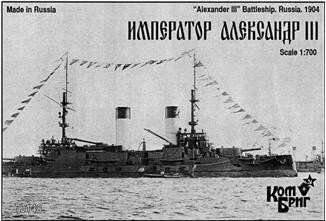 Battleship Imperator Alexander III was part of the Russian Second Pacific Squadron at the Battle of Tsushima. On 27 May 1905, after Japanese bombardment, she was sunk. When the Russian flagship at Tsushima, Suvorov was temporarily disabled, Alexander III turned to port and withstood concentrated fire from 3,000 yards (2,700 m). Turning southeast, she led the Russian line, until forced to stop to make repairs. By 6:00 PM her fires were out and she rejoined the fight. With her sister ships Borodino and Oryol she was again shelled at 7,000 yards (6,400 m), and the flooding became impossible to control. She capsized and sank, leaving four survivors.